I was in the grocery store getting stuff to make dinner. (Ok, yell at me later for why I didn’t plan ahead and had to be in a hurry!) To be honest, I wasn’t in as much of a hurry as most times. These two guys were walking around the store aimlessly talking on their phones. Not sure if they were calling back home with a “Honey, what aisle did you say the crackers were in?” but, it doesn’t matter. They would take a few steps forward, pause, chat on the phone, look around, take a few steps to the left, then pause and then to the right or simply just swerve back and forth. There were 5 of us trying to scheme how to get around them… including smashing through the English Muffin endcap! FYI, unconfirmed if they were talking to each other! But, I have zero idea how they got behind each other in such a perfect tandem! It was like following to old guys into the McDonald’s parking lot on any given morning as they head in for their all-day coffee chats. Boys… I don’t mean to be disrespectful but seriously, you’re not doing anyone any favors by trying to operate the shopping cart and talk on the phone. Just operate the grocery cart or go sit down and have a coffee and doughnut. Step away…. 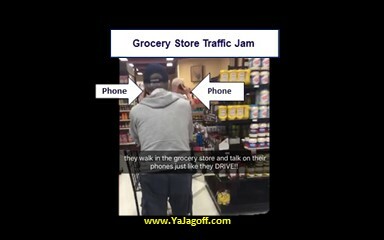 far away… from either the phone or the cart and let’s please focus on getting to the check out lines, Ya Jagoffs! Previous articleGetaway Car Ran Outta Gas?